From watching “Dennis the Menace,” “Beverly Hills, 90201” and “Saved by the Bell,” Julissa Arce’s American dream began at a young age. Growing up in Mexico, Arce watched American television shows with wonder and curiosity. She especially identified with Dennis from “Dennis the Menace” and recalled an episode where Dennis took revenge on a mean neighbor by putting his house on wheels. 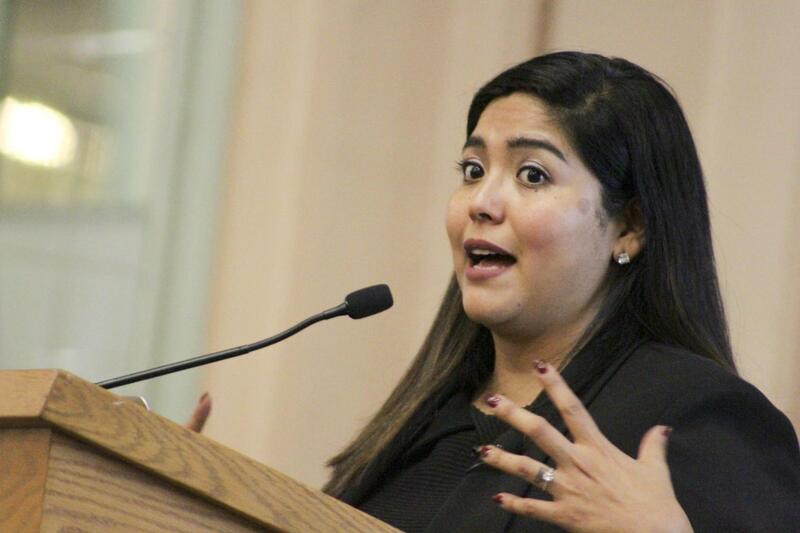 Arce — a former undocumented immigrant who rose to become a vice president at Goldman Sachs and director at Merrill Lynch — spoke to an audience of about 30 people at Pitt for International Week in the Union’s Ballroom. She talked about her own experiences and the immigrant issues currently happening in the United States. The author of “My (Underground) American Dream: My True Story as an Undocumented Immigrant,” Arce is a writer, speaker and advocate for immigrant rights. She also is the co-founder and chairman of the Ascend Educational Fund — a scholarship fund for immigrant students that enables them to have educational and professional opportunities regardless of their immigrant status. Despite recent success, watching these television shows throughout her youth, Arce formed an idea of what America was — and she didn’t quite fit in. At 11 years old, Arce’s family flew to the United States and moved to Texas with a tourist visa. When she came to the United States, Arce said she was told to assimilate and learn English. Learning English was a “means of survival,” she said, but the concept of assimilating was more difficult. Though Arce, now 34, had graduated in the top 5 percent of her high school class with extracurriculars, the American dream seemed far-fetched. She was rejected from all the colleges she applied to because she did not have a social security number and always left that section of the application blank. But Arce found her opportunity in 2001. Texas became the first state to accept undocumented immigrants into its universities, and she received a $10,000 scholarship to the University of Texas at Austin, presented to her by Texas Gov. Rick Perry. She got the internship at Goldman Sachs and was later offered a full-time job — which she obtained through purchasing a fake green card and social security number. At this point in her speech, Arce broke away from the story for a moment. As Arce spoke, projected on the screen behind her was a map showing states that had banned granting undocumented students access to higher education — such as Alabama and Georgia. But living in Texas, Arce had access to an education which opened doors to new opportunities. Arce concluded her speech by discussing Deferred Action for Childhood Arrivals — an executive order by former President Barack Obama that protected young undocumented immigrants brought to the country illegally by their parents — like Arce was. Pedro Pallares, an audience member, had a personal connection to this part of Acre’s speech. Pallares, a sophomore majoring in bioinformatics, is a former undocumented immigrant and said this speech was particularly influential for him. Pallares is now a citizen, but he and his brothers have been following Arce’s story for a long time, taking inspiration from her success for their own lives. Arce’s success story resonated with senior Christine Nguyen, a computer engineering major. Nguyen’s passion for advocating for minorities and her involvement in Pitt Excel — a program to help retain minority engineers in the engineering program — motivated her to attend the event. Arce said that her story had a happy ending. She became an American citizen through marriage and now uses her platform to advocate for immigrant rights. But she said there a lot of undocumented immigrants who no longer believe that the American dream is possible and that many immigrants are going back to their native countries.